As a dermatologist and a mother of two, I've gathered quite an assortment of tips and tricks over the years. 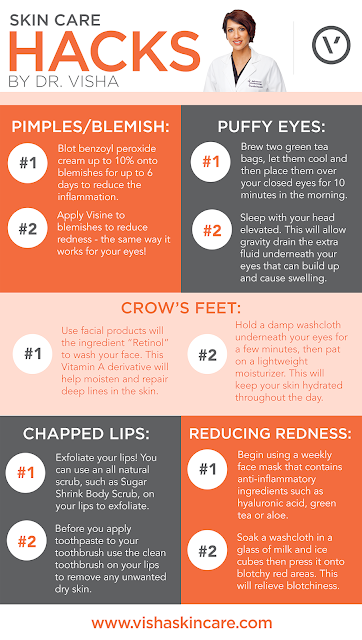 Whether you're dealing with crow's feet, frustrated with chapped lips or battling a blemish, I've got a skin care hacks for you. Tip #1: Blot benzoyl peroxide cream up to 10% onto blemishes for up to 6 days to reduce the inflammation. Tip #2: Apply Visine to blemishes to reduce redness - the same way it works for your eyes! Tip #3: Take a thin towel, cover an ice cube then dip the towel in tea tree oil and apply to blemish for 3 minutes. The cold will reduce inflammation while the tea tree oil dehydrates the blemish, killing the bacteria. Tip #1: Brew two green tea bags, let them cool and then place them over your closed eyes for 10 minutes in the morning. This caffeine from the tea will tighten the skin tissue and reduce swelling. Tip #2: Sleep with your head elevated. This will allow gravity drain the extra fluid underneath your eyes that can build up and cause swelling. Tip #1: Apply a daily moisturizer with an SPF of 30 to reduce sun damage to the very susceptible skin underneath your eyes. Tip #3: Hold a damp washcloth underneath your eyes for a few minutes, then pat on a lightweight moisturizer. This will keep your skin hydrated throughout the day. Tip #4: Always keep a pair of sunglasses handy and try to avoid squinting as much as possible. You can also opt for Botox which will help tighten skin and reduce the visibility of wrinkles. Tip #1: Exfoliate your lips! You can use an all natural scrub, such as Visha Skincare's Sugar Shrink Body Scrub, on your lips to exfoliate them. Tip #2: Before you apply toothpaste to your toothbrush use the clean toothbrush on your lips to remove any unwanted dry skin. Tip #3: Chapstick consists of wax and doesn't penetrate the dry skin, for really chapped lips try using Vaseline instead. Tip #1: Begin using a weekly face mask that contains anti-inflammatory ingredients such as hyaluronic acid, green tea or aloe. Tip #2: First, take an antihistamine then, soak a washcloth in a glass of milk and ice cubes then press it onto blotchy red areas. The cold temperature, pH level and protein in the milk will relieve blotchiness. Tip #3: If you are not allergic to flowers, break open an Evening Primrose Oil capsule and gently rub it over red areas. Tip #4: Visha Skincare's Bump to Baby when massaged into the skin every night, helps reduce redness and prevent the formation of the cracks both on the surface and under the epidermal layer.